If you are a crafter or artist like me you'll find often that the crafting room is typically the hardest room to keep organized...at least for me it is anyway. I know I could use the inspiration for my work area. I'm determined to find some new ideas to get my office more organized and decided to share here as I come across them...even if some of these rooms would seem to far from what would be a reality for me but I do hope to bring some of the ideas to light to actually put to great use. Here are some great creative crafting projects that lets you recycle items you would otherwise throw out! Framed Letter Photos are a Perfect Gift! This site and business was started up by close friends of ours. The Name In Pictures is where you can create a unique and personalized piece of art for yourself or as the perfect gift for someone special. There are multi ways you can custom create these very unique picture frames. The images are specific photos of objects that relate to a letter of the alphabet to then spell out any word or name you'd like. You can spell a first name, last name, or even an inspirational word. The possibilities are endless! Latest Creation by Cakes by The Sugar Cains! I find this site to be creatively cute as well as inspiring. This is one of their latest creations and I absolutely love this cake! It's delightfully imaginative! The only downside to these lovely cakes is that I'm not sure I could get myself to ever eat something so beautiful! I'm eager to see more cake designs as them whip them up for future occasions or just for the fun of it. It's been a joy to see them be so wonderfully creative. Congrats to the Cains to being able to find and embrace their true creative side! Browsing the internet...I came across this lovely site full of design inspiration. This talented person is Amy Atlas she swarms with natural talent in all her deliciously delightful looking displays. Does your refrigerator need a pick-me-up? Hold those family pictures or reminder notes in place with your own handmade decorative glass magnets. These fancy magnets can be customized with scrapbook paper to take on any look you want. 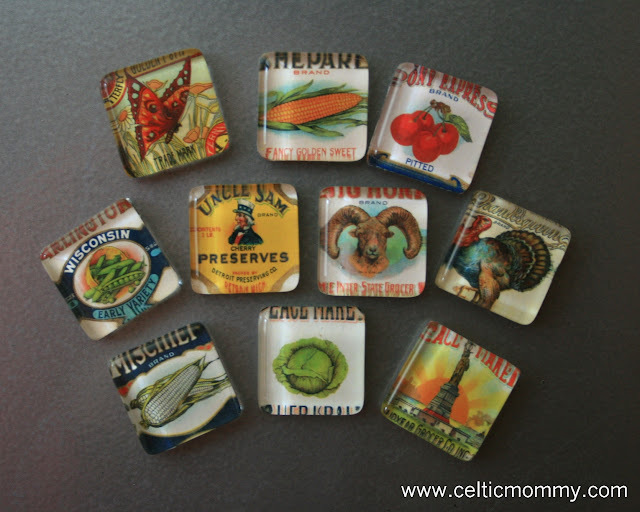 Decorative magnets also make a fantastic gift and are simple and easy to create. This was posted over a year ago and I currently do no have these up on my shop for sale. However I still have plenty of them in stock. I plan to have them up again soon at a very discounted rate to de-stash. If you're interested in buy some let me know. I've been working hard getting these hair bows completed. Right now I have a good mix of floral and bows with rhinestones of course! Take a sneak-peek of what will be for sale on the online All things creative By Lil Miss Katie's, LLC. I'd love to hear any feedback if you would be so encouraging to spare some of your time and thoughts. I'm lucky enough to be able to have my beautiful 2 year old model some of the new items for me!